A moist muesli which features a glaze of natural glucose which is nutritionally formulated as a complete and balanced diet for the fussiest of eaters whether at rest /play or home. 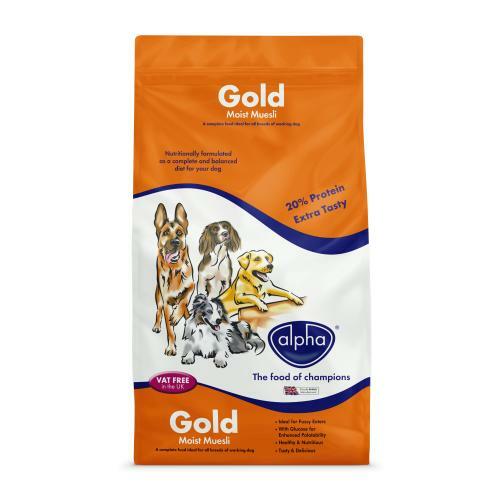 Alpha Gold 'Moist' Muesli is nutritionally formulated as a complete and balanced diet for all breeds of working dog A unique and moist blend of the finest cereals, peas, beef chunks and wholesome biscuits that are carefully cooked to produce a highly palatable food with no need to add anything extra. The flavours are sealed with a glaze of natural glucose that provides a moist but crunchy food. Alpha Gold Moist Muesli therefore encourages a good appetite and is ideal for the fussiest of eaters.